Did you ever notice how difficult it is to eat healthy when hunger strikes? Your little one wants a snack; you go to the kitchen and start looking around. Often we find ourselves in this situation. The key to keeping it healthy is planning. I know! We’re all busy. 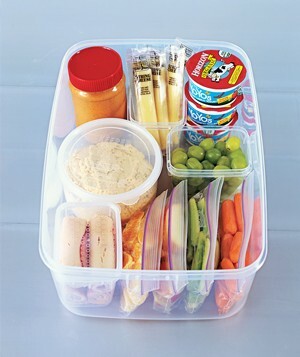 In the spirit of spring cleaning and getting organized, consider organizing snacks with a snack station. Inspired by Realsimple.com, today’s idea is a grab-and-go snack stashes. Using a larger bin – consider Tupperware, something that can be cleaned easily – place a variety of snacks that can be mixed and matched for treats. You can use snack size sandwich bags to portion out orange slice, baby carrots, celery sticks, pepper slices. You can even rotate these treats to showcase whatever is seasonal, like berries. Include grapes, lunch meat roll-ups (like turkey and Swiss of ham and cheddar), yogurt, string cheese and, for dipping, a jar of peanut butter and hummus. Make a habit of refilling your snack station one day a week, say Sunday night. Once it’s ready, you can tell your kids to grab something when you’re busy without worry. And, you can pick up a small bag on your way out to the many baseball and soccer games going on. Those chips are tempting, but not the best option for your little one – or you. How will you personalize your snack station?